This is an admittedly goofy post, but maybe it points some folks in the right direction. One question that comes up is around how can you better manage a large lookup list in Datazen. Currently, the product doesn’t allow search functionality in the dropdown list. There is a way to work around this, however. Previously, I posted about how to set default selection values in Datazen dashboards viewed in a browser. The next logical step here would be to build a custom app and pass the values to that url. 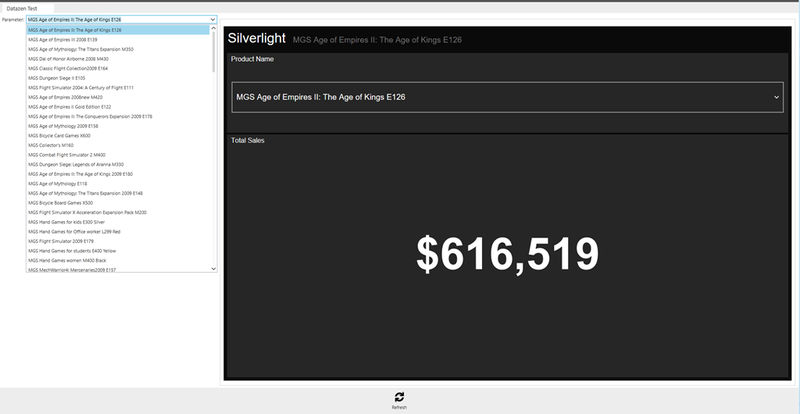 I did just that, and I built the app in Silverlight! 1. 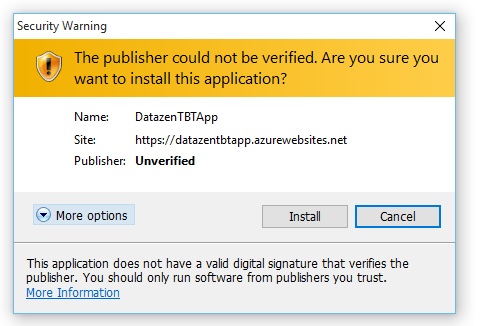 Go to https://datazentbtapp.azurewebsites.net/desktopclient where you’ll be prompted to install the app locally on your machine. There’s no security on it or anything (and I didn’t bother signing the .xap file). 2. You’ll see the little DatazenTBTApp logo on your desktop if you choose that option. Double-click on it to open the desktop app. That’s basically it – feel free to try typing in some different letters/words (obviously Fabrikam and Contoso are well represented in this product list), watch your dashboard update, and relive the magical year of 2010!